Thanks for visiting the Peter Aston website and welcome to the April 2019 update - and Easter is just around the corner. 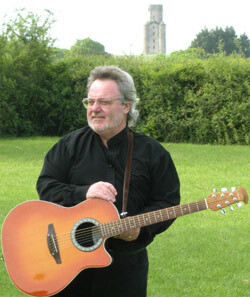 If you're visiting this site for the first time, a quick introduction - I'm Peter Aston, a Christian singer/songwriter and worship leader based at Holtwood Methodist Church which is a welcoming, evangelical church in an idyllic location near Wimborne, close to the south coast of England. As a member of HMB I also play guitar, sing and help to lead services at churches in and around Dorset The HMB flautist Becky Neale and I also give concerts in our local area - and occasionally much further away! I'm also the caller/guitarist/singer for the Cottage Industry ceilidh band, a solo singer/songwriter and a medieval wandering minstrel known as Master Peter of Fayrewood. As a solo entertainer I appear at many retirement homes and day centres and for charitable and other events, singing everything from war-time sing-along classics, through the 50's & 60's pop songs to traditional and original songs. For the past few years I've been doing my thespian bit as a member of the 'Open the Book' Team which takes dramatised, costumed and propped (if that's a word!) presentations of Bible stories into local 1st Schools - a tremendous privilage! To find out more about what I get up to please click on the banner at the top of this page - hope to catch up with you somewhere down the road!